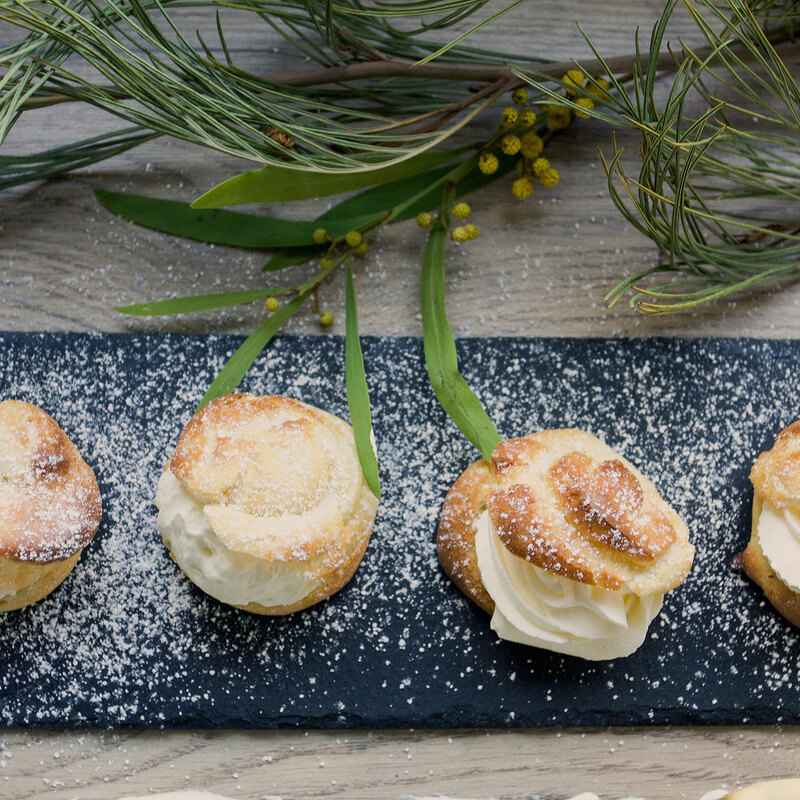 The day of the Petit Choux semla has finally arrived! It’s the official Semmel day in Sweden today. I love these little creamy delights. When I was a kid, now no judgment, I was little. I ate so many of them I got really sick. I couldn’t eat a Semla for what it felt like ages. However, I now make up for lost time. I love traditional Semla too. But this little Petit choux Semla is pure perfection. It takes a lot less time to do than the traditional one. They are also perfect in size. Just a little mouthful. It’s difficult to eat only one, I promise. 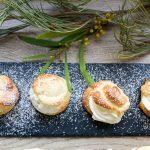 Petit choux are actually quite easy to make, just make sure that you follow the instructions carefully. Watch them as they bake in the oven, they get dark brown in heartbeat. 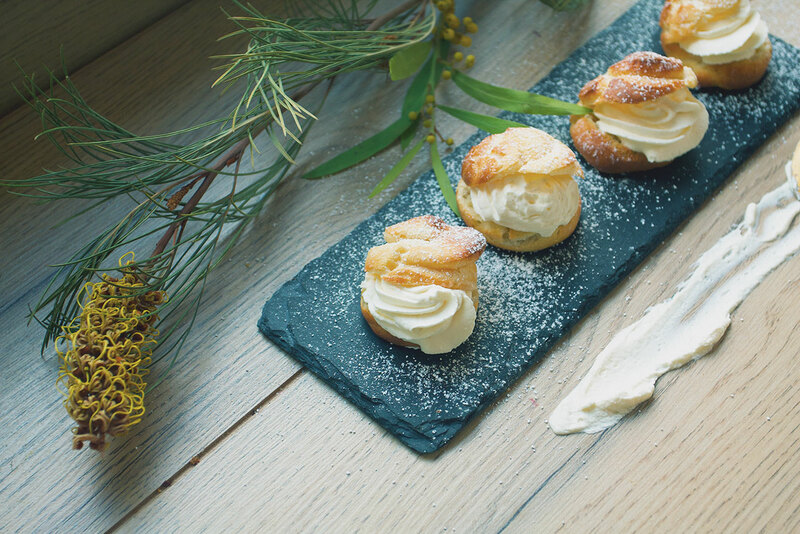 Of course, if you don’t want to follow our Swedish tradition and make a petit choux semla, you can fill them with any other cream you wish. Perhaps a rich chocolate filling? 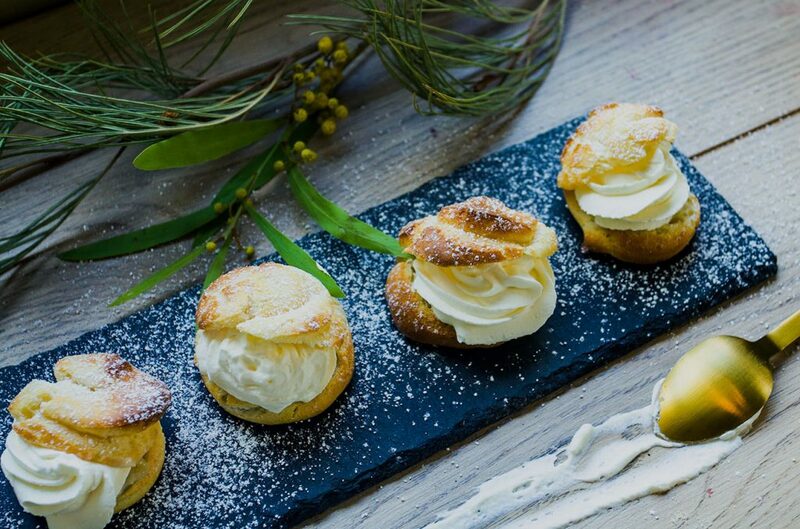 The French meet the Swedish in one delicate bite of a puff pastry with fluffy whipped cream and almond paste. Put the oven to 200C/fan. Mix water, milk, sugar and butter in a pot on low heat. Mix in the flour and stir strongly with a wooden spoon. Stir until the batter is no longer sticking to the edges of the pot. The batter should get shiny on the surface. Take the pot off the heat. Add one egg at a time. It's important you mix one egg at a time and mix it properly. You will now get a creamy batter. Pour the batter into a piping bag and pipe the batter into small round balls. Leave some room in between them. Bake in the middle of the oven for about 15-20 minutes. Keep an eye on them. When they are lightly brown open the oven door ever so slightly and leave the petit choux to dry for 5-6 minutes. Take them out of the oven and let them cool properly before filling them. Make the almond paste by grating it and mixing it with icing sugar and almond milk. Whip the cream until firm and smooth. Cut them in the middle and add a teaspoon of almond paste. Pipe whipped cream on top and sprinkle with icing sugar. They will expand quite a lot in the oven, therefore it's important not to pipe them too close to each other.